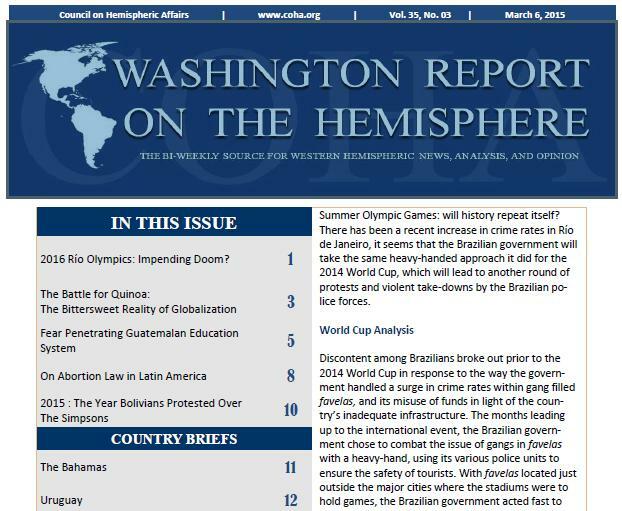 The Council on Hemispheric Affairs’ biweekly publication, the Washington Report on the Hemisphere (WRH) is widely considered to be one of the most respected and reliable publications of its kind. Circulating since 1980, the WRH has a far-reaching audience consisting of academics, regional analysts, and editorial page editors, corporate vice presidents for Latin American operations, senior financial officers, respected journalists and diplomats throughout the globe. Brazil’s Ficha Limpa (Clean Record) Legislation: Will it Run Over Corruption or Will it Run Out of Steam?